Explore the best sites in the Historic District of Savannah on this hop-on hop-off trolley tour of the city. Visit many of Savannah’s top attractions — like the City Market, Forsyth Park and River Street — on a 90-minute loop. Select a 2-day pass, then board at any of the 15 stops and get to know the city in custom fashion, with live on-board commentary from a professional tour conductor. Then take a spooky ride through this haunted city on a guided, 90-minute evening trolley tour. Hotel pickup and drop-off included. Enjoy the freedom to build your itinerary to best fit your stay. Take the hop-on hop-off the same day as your haunted tour or take them days apart. The choice is yours with this package! Get to know the city of Savannah and its top attractions in convenient and economical fashion on this entertaining and educational hop-on hop-off tour. It all begins with a hop-on, of course, at any of the 15 stops. Board one of the blue trolleys and enjoy the view with a live commentary of interesting facts and stories from an expert guide who knows the city inside and out. Learn about the history and happenings of Savannah, one of the largest National Historic Landmark Districts in the US, as the trolley rolls along from one location to the next. Hop-off at any of the attractions for a closer look, then hop back on when it’s convenient. Visit popular sites like the open-air City Market, the 30-acre Forsyth Park and bustling River Street — plus the Cathedral of St. John the Baptist and the entire Historic District — to name just a few. It truly is a fun and fast way to get to know the city of Savannah, its history and the cultural attractions it offers. The entire loop takes 90-minutes to complete. Then take a spooky ride through one of the most haunted cities in the US on a guided, 90-minute evening trolley tour. Travel through the shadowy squares of the Savannah Historic District, one of the largest National Historic Landmark Districts in the US. Learn about local legends, house hauntings — even the occasional exorcism — plus Gullah traditions and superstitions, some of which are still practiced today. It’s a fascinating, spine-tingling adventure. 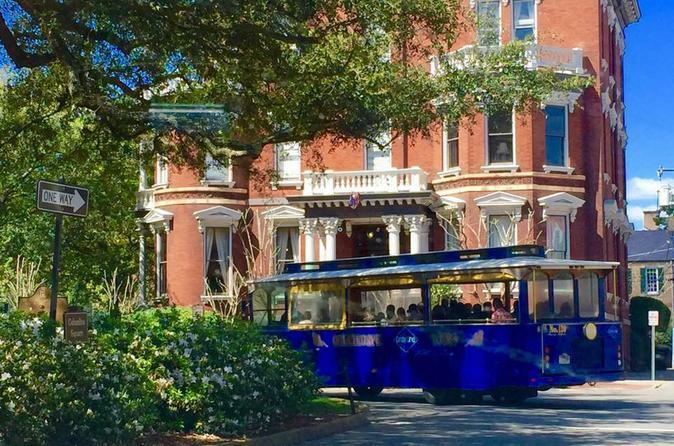 A sightseeing tour of Savannah has never been easier — or more fun — than these trolley tours of the city. Experience Savannah in this unique way. A hotel pickup and drop-off are included from select Historic District accommodations if requested at the time of booking.